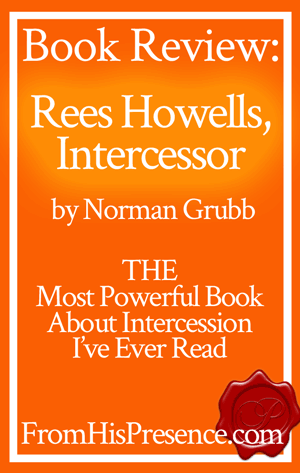 The book Rees Howells, Intercessor by Norman Grubb changed my life. I was a new Christian and someone recommended the book to me. I felt led to read it, and when I did, I was powerfully and supernaturally called, commissioned, and empowered for intercession–all at the same time. This book is the biography of Rees Howells, a powerful intercessor and missionary whom God commissioned out of the 1904-1905 Welsh Revival. Howells was a lot like me, and maybe like you. He didn’t just have everything he needed drop out of the sky for him. Instead, he had to labor in prayer for everything he needed–and for everything God called him to do. But the thing is, because Howells was willing, God Himself taught him how to pray. And not just to pray; to intercede. Prayer is prayer. Intercession can be prayer, but it can be other things too. Intercession is a more intense activity than prayer because it involves being willing to lay down your life as a highway for God’s Kingdom to come and His will to be done in someone else’s life. Intercession makes you like Jesus. After all, HE laid down HIS life for His Kingdom to come in your life and in mine. Intercession is powerful. And Holy Spirit Himself taught Rees Howells how to intercede. Howells took that knowledge and practiced it, continuously under the tutelage of Holy Spirit, his whole life. He interceded for individuals in his hometown, and saw dramatic results. He was a missionary to Africa, and he saw a great revival there–because of his obedience in intercession. Later in life, when he returned to the British Isles, he started a Bible college, where he taught his students how to intercede. And he and his students prayed the Allies through World War II. Howells was a man of intercession. And Rees Howells, Intercessor will teach you how to become a man or woman of intercession too. It will inspire you. It will challenge you. It is likely to make you weep. Possibly like a baby, laying on your floor, crying for hours at at time. Reading Rees Howells, Intercessor will bring you to desire a greater level of surrender to, and infilling of, the Holy Spirit than you have ever experienced before. The Amazon links above are my affiliate links. This means, if you click through my link to purchase a resource on Amazon, Amazon will pay me a small commission (at no additional cost to you of course). Thanks in advance for supporting my blog in this way! And if you love to read legal mumbo-jumbo, you can delight yourself in my disclosure policy here.